From the Launch Window, click the button. Noteman says: When you install a new version of Finale on your computer, Finale preferences are not copied from the previous version. To migrate these settings, see To migrate settings and support files from one version of Finale to another. 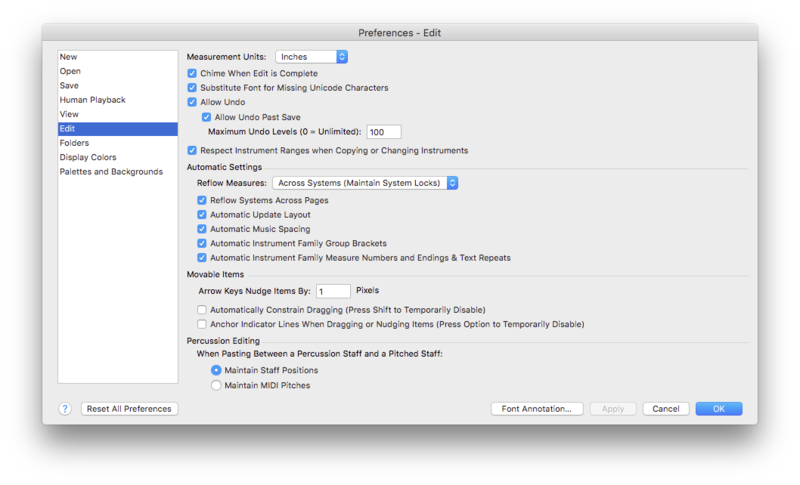 The Preferences dialog box lets you configure Finale’s program-wide settings. Click a category on the left to see its corresponding options appear on the right side of this dialog box. For example, click the Save category to specify whether to save your preferences automatically when you exit Finale, or only when you explicitly use the Save Preferences command. You can make as many changes as you like before returning to your score by pressing the Apply button when you have finished changing the settings for any category. The settings in this dialog box are saved in the com.makemusic.Finale.plist file (in your Preferences folder). Reset All Preferences • Apply • Cancel • OK. Click Reset All Preferences to revert your Finale preferences to Finale's default state. Click OK (or press enter) to save the new settings and return to the document. Click Cancel and you will be prompted to save or discard changes that have not been applied. Click Apply to save the selected changes in your dialog box and keep the Preferences box open. Choose Finale > Preferences and select New. Choose New to make settings related to opening new documents. Change the default file name, select the type of document to open when launching Finale and specify how to view any new document when it first opens. Default Document. Type in the name of the Template you want to use for your default file. Finale's included default document, Maestro Font Default.ftmx, is located in the Finale/Music Files folder. This file is used when you choose File > New > Default Document and it is the document used to create a Finale file when you import a MusicXML file or open a MIDI file. Default New Operation • Setup Wizard • Default Document. 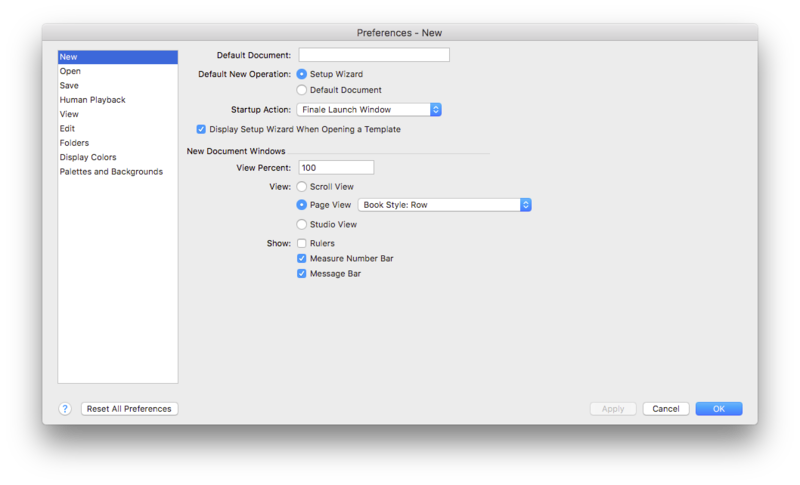 Select one of these options to set the keyboard shortcut for New (COMMAND+N) to the default document or Setup Wizard. Startup Action: Finale Launch Window • Document Setup Wizard • New Default Document • New Document with Template • Open Document • No Action. Select which item from the File > New submenu will be your preferred startup action. Document Setup Wizard will take you through the Setup Wizard on startup. New Default Document will open a new document based on your selected default file. New Document with Template will allow you to select a template to open as the basis of your file. Open document will allow you to open any document. No Action will just allow Finale to start and not open any document on startup. Display Setup Wizard When Opening a Template. Check this box to indicate that you would like to open the "Score Information" and "Score Settings" pages of the Setup Wizard to customize templates prior to opening them. These pages appear after choosing the File menu > New > Document From Template and opening a template file. Uncheck this box to indicate that you would like Finale to open templates without prompting you with these pages of the Setup Wizard. View Percent. Select the View percentage new documents should display when opened. View: Scroll View • Page View • Page View Style • Studio View. Select which view, Scroll View or Page View, new documents should display when opened. From the Page View Style pop-up menu, choose the desired Page View Style. See Page View Style submenu. Rulers. Select this option if you want Finale to display rulers in Page View when new windows are created. This setting affects the initial setting of the Show Rulers command in the View menu. To show or hide rulers in an individual window without affecting the Preferences, use the Show Rulers command. Measure Number Bar. When this option is checked, a Measure Number Bar appears at the top of the screen in Scroll and Studio View. Measures shown in the Measure Number Bar will respect the Preferences - View dialog box. Message Bar. Select this option to show an information bar at the bottom of your score that indicates what function is being used and gives quick tips on how to use it. Choose Finale > Preferences and select Open. Use the Open category to specify how Finale treats various types of files while opening them. Open Legacy Documents as "Untitled". This option is checked by default. When this option is checked, Finale opens a file created with an earlier version of Finale as an untitled document, requiring you to enter a name before it can be saved. This is done to protect you from inadvertently overwriting your older file, making it unreadable in an earlier version of Finale. Set Human Playback to Standard for Finale Notation Files Created Prior to Finale 2004. 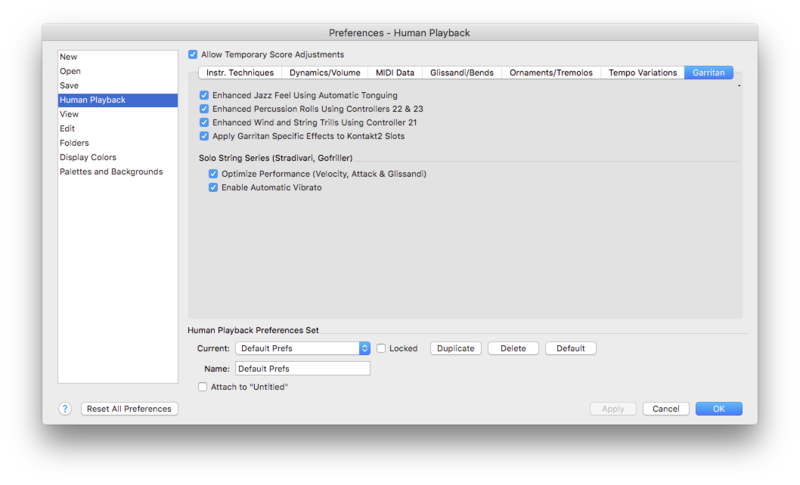 Choose this option to automatically enable Human Playback while opening files created in earlier Finale versions (pre-Finale 2004). See Playback Settings dialog box. Warn When Opening Files from a Newer Version of Finale. Use this checkbox to determine if the File Compatibility Warning dialog box appears when opening newer Finale files. Clean Up File Data • Show Any File Data Clean Up Results. Check Clean Up File Data to automatically run Finale's File Maintenance mechanisms, including Remove Deleted Items, when opening files. See File Maintenance dialog box. Check Show Any File Cleanup Data Results to display the Deleted Items Statistics dialog box when the procedure is complete. See Deleted Items Statistics dialog box. Automatically Convert Text in Files from Other Operating Systems • Show Dialog on Automatic Conversion. Check to Automatically Convert to translate upper-ASCII characters (such as è, ö and hard spaces) into the appropriate character on the current system. If Finale was unable to translate the character, it will display the problem character as a question mark. Finale only checks text fonts, as defined in the MacSymbolFonts.txt file, not music or symbol fonts. See Configuring MacSymbolFonts.txt. Check "Show Dialog on Automatic Conversion" to display a list of text items checked, items converted and other information about the conversion process. Automatically Sync Files to Symbol Fonts List. Check this box to automatically sync fonts to the Symbol Fonts List if fonts used in the file being opened are not included in the Symbol Font list. For information regarding adding fonts to the Symbol Font List, see Configuring MacSymbolFonts.txt. Tie Conversion: PostScript • Screen • Ask When Converting. These options are used when converting files previous to Finale 97 for determining how to handle ties. In versions before Finale 97 ties were represented differently on the screen than when they were printed on a PostScript printer. Because Finale 97 and later versions no longer have this difference, older files can be converted either using the screen representation of ties, or using PostScript settings of ties. You can also have Finale ask about converting ties during the conversion process by selecting the Ask When Converting check box. Hidden Note: Reveal the Hidden Notes • Keep the Notes Hidden • Ask When Converting. Choose Reveal the Hidden Notes to automatically show all staves that include notes that were previously hidden due to optimizedA former Finale feature that suppressed any empty staves (in a staff system) from page view and the printed page. Optimization was replaced with the Hide Empty Staves command in Finale 2011. systems when opening files converted from Finale 2010 or earlier. (If you have not intentionally optimized systems in order to hide notes, choose this option). Choose Keep the Notes Hidden if you want staves with hidden notes to remain hidden (usually in order for these notes to apply to playback without showing). When you choose this option, Finale automatically applies a Staff Style to all hidden staves with notes in systems that were formerly optimized. After opening a score with this option chosen, you can view the hidden measures in Scroll View. While in Scroll View, choose the Staff tool to display Staff Style bars above measures that have been hidden. To show Staff Style names in the bars, choose Staff > Show Staff Style Names. Measures that have been hidden automatically can be identified by the "Hidden Staff (Auto-created on conversion)" Staff Style. Check Ask When Converting to display the Hidden Notes Found dialog box whenever notes exist in hidden, optimized staves when converting old files. Articulation Conversion: Enhance • Keep Positioning • Ask When Converting. Automatic stacking and enhancements to articulation default positioning were introduced in Finale v26. 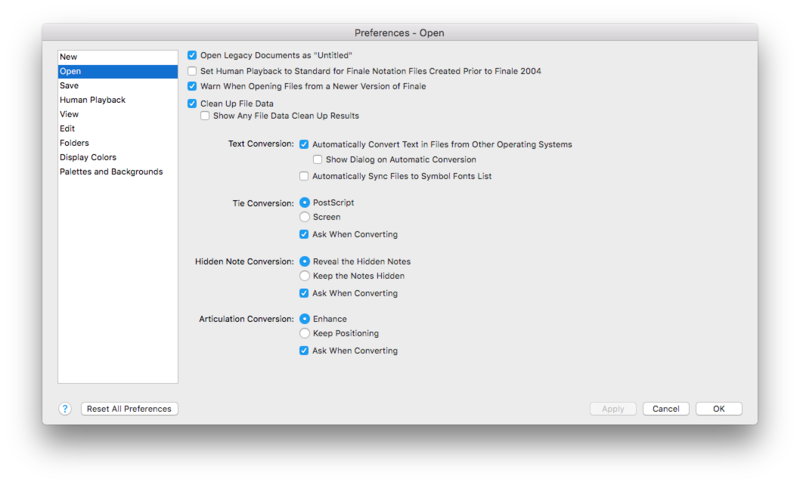 These options allow you to set Finale's behavior when opening older files. If you would like Finale to update articulations and remove manual adjustments, choose Enhance. Choose Keep Positioning to maintain any manual positioning made to your articulations. A document can be changed anytime by using the Change Articulation Assignments dialog box. Check Ask When Converting to have Finale prompt you with the Update Articulation Positioning dialog box each time a document created prior to Finale v26 is opened. Uncheck this option to set Finale's behavior based on the options above. Choose Finale > Preferences and select Save. 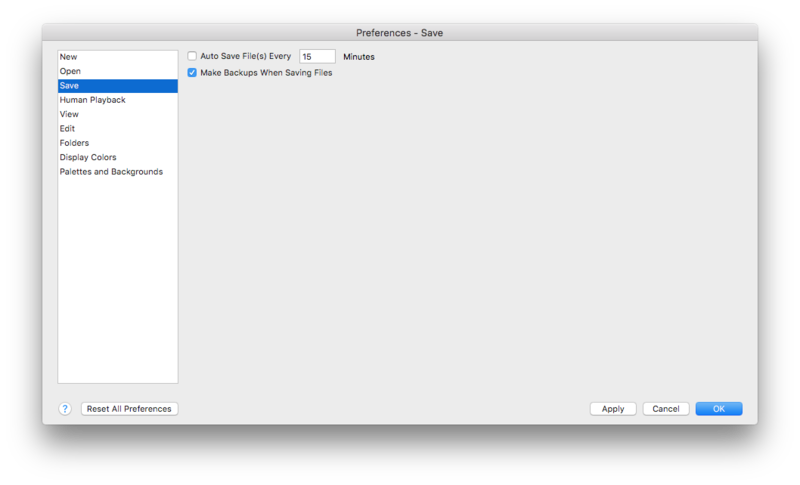 In this category, set Finale to save automatically at regular intervals, make backups while saving, or save preferences while quitting Finale. Auto Save File(s) Every ___ Minutes. If you tend to forget to save your work to your hard disk every so often, Finale’s Auto Save command is a good safety net. When this feature is on, Finale updates a second copy (not the one you’re working on) at regular intervals. This second copy of your file is stored in the folder specified in the Preferences - Folders dialog box. With this option selected, specify how often Finale should save your work to the duplicate copy of the file you have open. After the number of minutes that you specify have passed, a message will appear letting you know that Finale is saving your work. (This feature does not save your changes when you exit from Finale, however. Be sure to save changes to your primary file when you exit.) Once you save your document, any existing auto-save files are automatically deleted. Make Backups When Saving Files. If this option is selected, Finale automatically saves a backup copy of your file in the Backup folder specified in the Folders group box. If no folder is specified, the backup files are stored in the Music folder. Each time you save a particular document, the prior version of the file that you saved is preserved as a backup. Therefore the backup is always one version behind your current file (in case you just saved something you shouldn't have). Keep in mind that the first time you save a file, no backup is made, because there isn't a previous version to preserve. Similarly, no backup is made when you perform a Save As function. 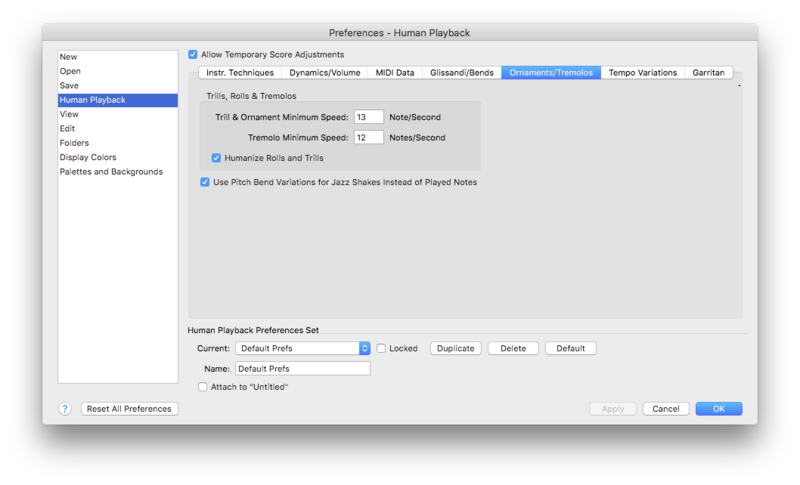 Choose Finale > Preferences and select Human Playback. Choose Window > Playback Controls. Click the button on the Playback Controls. Choose the MIDI tool and select a region on the staff. Choose MIDI Tool > Apply Human Playback. This dialog box allows you to customize intricate details of Human Playback’s interpretation. Explicit performance techniques indicated on the score, such as the type of mute or bowing style, can be specified here. But this dialog box controls more subtle nuance as well. In an orchestral rehearsal, aspects of this dialog box would be equivalent to directions from the conductor scribbled on parts, such as how to approach a fermata, or the amount to exaggerate certain dynamic markings. In fact, even MIDI data you have specified manually can be intertwined with Human Playback’s interpretation using these settings. In general, the settings here are program-wide, but a configuration can also be saved and “attached” to a specific document. Similarly, a configuration can be transferred across documents. Allow Temporary Score Adjustments. Check this box to allow Human Playback to adjust the horizontal position of score items while processing the score for playback. Any adjustments made to expressions or other score items return to their original position after playback. Human Playback Preferences Set. 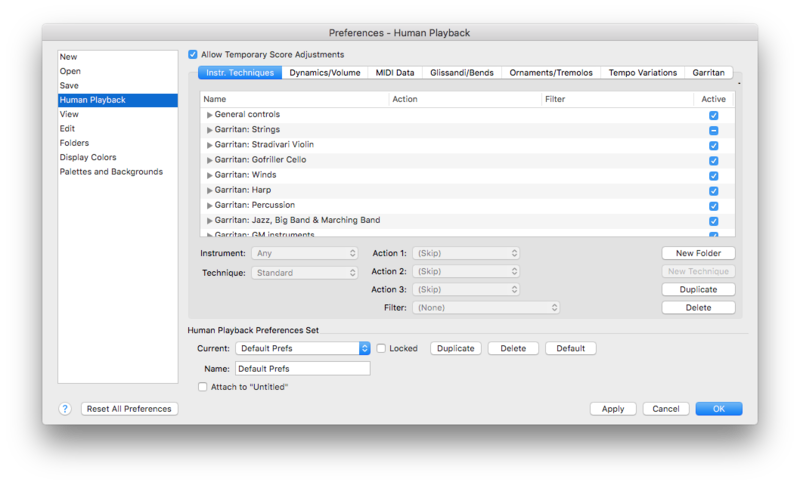 The default Human Playback Preferences set handles playback for SoftSynth, Garritan Instruments for Finale, Garritan Personal Orchestra, and other Garritan products including Jazz & Big Band (“JABB”), and Marching Band - all automatically. Current. The current Human Playback Preferences Set is displayed here. A Set is simply a configuration of settings from all pages of this dialog box (similar to the Document Options dialog box). All available sets are listed under this pop-up menu. Name. Use this text box to name the current set of preferences. Typing in this text box automatically changes the name in pop-up menu. Attach to [filename]. When you check this box (and save), the current set of preferences is duplicated and reserved for use with this file instead of the program-wide set. To indicate a Human Playback Preferences Set is attached to a file, “attached” appears in the Current pop-up menu. When a set is attached to a file, changes to this dialog box apply only to the attached set (for the active file only). If you decide to select a different set under the Current pop-up menu (or uncheck Attach to Active File), you are prompted to either save or discard the set. If saved, the set appears in the Current pop-up menu for all files, and is available for program-wide use or to be attached to another file. If you discard, the set is lost. Locked. Disables all dialog commands to prevent any accidental changes on a given preferences set, whether it is attached to a file or not. Duplicate. Click this button to copy the current preferences set into a duplicate set. Using Duplicate is a convenient way to begin designing new custom sets if only some items require changing. Delete. Click this button to delete the current set of preferences. Default. Click this button to reset all options in this dialog box to their original default settings. This applies only to the currently selected preferences set. These settings allow you to define and customize performance techniques, such as pizzicato or flutter-tongue. They also provide a way to take advantage of the full range of sounds in a given sound library and allow you to specify settings for an individual playback device. For example, if GPO and SoftSynth are both used in the same document, different Human Playback instrument techniques can (and should) be used to accommodate for the unique properties of the playback device. This is particularly the case while using combinations of other sound sample libraries (e.g. Garritan Personal Orchestra, Garritan Jazz & Big Band, and EWQL). Using these settings, Human Playback is able to produce more accurate and realistic playback, and can take full advantage of any combination of sound devices. All available instrument techniques are listed in this window. Each technique listed includes the name, action summary, filter, and check box to specify whether the technique is active. Folders are used to organize techniques and are expanded and collapsed by clicking on the triangle next to the folder name. Techniques and folders can also be dragged and dropped, although you cannot create a folder within a folder. Instrument. This pop-up menu lists instrument categories and individual instruments that have special techniques generally available in sound libraries. Technique. The techniques listed here depend on the Instrument pop-up menu selection, and correspond to the type of techniques possible for the selected instrument. The technique chosen is enabled by the notation, whether it be articulations, expressions, Smart Shapes, or by the musical context (e.g. a détaché passage). Choose Custom Text, and then type in the Filter text box to use specific expression text to trigger a technique. Action 1 • Action 2 • Action 3. Using these pop-up menus, you can pinpoint specific properties (such as keyswitch or controller data) for the chosen technique. The pop-up menus and text boxes to the right are values for the specific actions, depending on the kind of action. The actions you should select for a given technique depend upon the features available in the sound library in use. Filter. Choose an item from this pop-up menu to apply an additional filter for the technique. Enter text into the text box to the right to specify a particular variable. For example, you might apply a technique only if the playback device’s name includes GPO. This field is also used to specify expression text for the Custom Text technique. New Folder. Click this button to create a new folder in the Techniques window. New Technique. Click this button to add a new technique to the selected group. Duplicate. Click this button to duplicate the currently selected technique or group. Using Duplicate is a convenient way to begin designing new techniques if only some items require changes. Delete. Click this button to delete the selected technique. Expand a technique folder and click a line to select a technique for editing. Not all instruments are listed here, only the ones that have special techniques generally available from sample libraries. A similar technique will be applied by priority to each individual instrument. For instance, if “pizz” is defined twice, first for “Strings” and then for “Violin”, the “Violin” pizz will be applied by priority to violin staves, ignoring the “Strings” pizz. This last filter is particularly important. In our case, the pizz, as defined here, will be applied only for slots (Audio Units external through MIDI Setup) which have a name containing “Garritan”. In Vienna Symphonic Library, for instance, (packaged with Kontakt software), the KS sample Violin Ens 14 (All X) would require different settings: violin only, keyswitch note 18, use CC#1, device name containing “kontakt”. The program change #46 applies only to SoftSynth or external MIDI playback. It is important to emphasize that Human Playback scans all available playback devices automatically, whether they are Audio Units-based, SoftSynth, or external playback (MIDI setup), but always leaves the choice of customization. Legato (Slurs) is enabled with slurs and ornaments; GPO, for instance, uses CC#68 for the legato effect, but some other sample libraries have devoted patches (QLegato in EWQL, True Legato in Vienna, …). Staccato can be enabled for series of shorts notes, whether it comes from the notation (staccato articulations) or from the user MIDI stop time value. What “short” means for Human Playback is hard-wired. Trills are normally created by Human Playback as actual “virtual” notes, but some sample libraries do offer sampled trills. Keep in mind, however, that those sampled trills generally have fixed speed. Sampled trills, if defined in list, will be used only in strictly monophonic context; otherwise, regular triggered Human Playback trills are used. Dynamic Controller is to be used in conjunction with Use CC#1… Use CC#11+Velocity, Velocity Only types of action (see Types of Actions). It may override the global Dynamic & Volume / Controller for Sustaining Instruments option, for any particular device slot, staff or MIDI channel. Custom Text functions as explained above. Due to the quantity of string techniques, the terminology Human Playback uses does not always match the academic vocabulary, but rather a sample library-oriented compromise. Spiccato, for Human Playback, means very short staccato, whether from actual notation (articulations) or from user MIDI stop time edits. Martelé (Martellato) means heavily accentuated, relatively short, non slurred, notes. From notation or user MIDI data. Détaché means non-slurred, normally accentuated, notes, alternating up and down bows. No special notation required. Tremolo is non-measured tremolo. Notated with 3-mark tremolo diddle (or 2-mark on 8th notes, 1-mark on 16th notes and shorter). Sul ponticello (text) is playing near the bridge. Canceled by “ordinario” type of expression. Sul tasto (text) is playing near the fingerboard. Canceled by “ordinario”. Flautando (text) is a flute-like tone, by slightly touching the string with the edge of the bow. Canceled with “ordinario”. Bartok Pizz. Snap pizzicato. In Finale, they are notated as a shape-based articulation. Col legno. Played with the wood of the bow. Human Playback currently makes no difference between bowed or stroke col legno, but the user could, using the text filter. Harmonics. To be used in conjunction with Human Playback regular harmonic playback. Note that Human Playback now supports natural harmonic playback, using the little “o” on the note (don’t confuse with “0” which means open string). As an example, when sul ponticello is encountered, Human Playback scans backward to determine whether a con sordino precedes, but only if there exists a technique definition (= a technique line) for the combination Ponticello+Mute, and for this particular instrument; otherwise, the plain (= no mute) Ponticello definition is used (if available of course). It works the same for Tremolo and sampled trills. Fluttertongue (notated like a strings tremolo). Note that Garritan Jazz and Big Band and Garritan Personal Orchestra have different way of enabling flutter-tongue (in GPO, this is a keyswitch; in JABB, CC#18). Both are supported by the default preferences set. Cup, Harmon, Bucket mutes (text). These are found in JABB, enabled by various wording. Controller has 2 parameters: the controller# and the value. Controllers are generally used for any type of sound and tone change, depending on the sound library context. 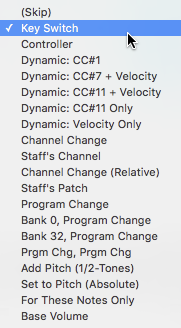 Dynamic CC#1 … Dynamic: Velocity Only have no parameter. They simply tell Human Playback to force a particular dynamic approach. In Action 1, this is only used for the technique “Dynamic Controller” which, in conjunction with the filter text box, may override the global setting (see Human Playback Preferences - Dynamics/Volume, below) for some specific channels, staves, or devices. In Action 2 or 3, this is used for the pizz to specify the type of dynamic approach, locally. Timpani rolls are another example: timpani hits are velocity-based, but rolls are generally CC#1-based (in EWQL SO), so both approaches must be able to coexist within the same notation context. Channel Change has one parameter, the MIDI channel. Channel change can be used in place of keyswitches to change sample. Staff’s Channel. This means to go back to the original staff’s channel. This is generally used for “Ordinario” or “Standard” techniques. Channel Change (Relative). The corresponding pop-up is from –16 to +16. This is particularly useful because it does not depend on absolute channel #, and some prefer to always organize their sample the same way (arco=#n, pizz=#n+1, tremolo=#n+2, as an example). Staff’s Patch. Goes back to the original staff patch, for patch-based (a la GM) samples. Program Change … Prgm Chg, Prgm Chg. These four options provide corresponding parameters for changing MIDI bank and/or program change information. Additional types of actions include: Add Pitch (1/2-Tones) (for use with percussion rolls), Set to Pitch (Absolute), For These Notes Only, and Base Volume. The filter text is meant to be case-, space-, and punctuation- independent (dots, dash, accents. …). Different items may be separated by commas. 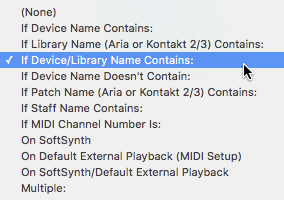 If Device Name Contains • If Library Name (Aria or Kontakt 2/3) Contains • If Device/Library Name Contains • If Device Name Doesn't Contain • If Patch Name (Aria or Kontakt 2/3) Contains • If Staff Name Contains. As seen above in the example, the device name can be from Audio Units slots, or MIDI setup slots, or “SoftSynth”, or “QuickTime”. Example: “garritan” will filter devices “Garritan Instruments for Finale”, “Garritan Personal Orchestra” or “Garritan Jazz”. Likewise, the filter can apply to the names of instrument patches or staves. If MIDI Channel Number Is. Human Playback expects channel numbers here (1-based). Example “1-16, 20, 126”. Channels or channel ranges must be separated by commas. On SoftSynth. Technique will apply only for SoftSynth playback. This is the same as entering “softsynth” when “If Playback Device Name Contains” is selected. On Default External Playback (MIDI Setup). Technique will apply only for playback through the external MIDI device specified in the MIDI Setup dialog box. On SoftSynth/Default External Playback. Technique will apply only on SoftSynth or MIDI Setup playback. This is the same as entering “softsynth, external” with “If Playback Device Name Contains”. Multiple. Multiple allows you to move, duplicate, delete, and edit multiple techniques at once. You can filter techniques for specific library and patch names - #library# and #patch# respectively. For example: "#library#FinaleGPO #patch#Viola KS". If text expression contains. This option only appears for the Custom Text technique. Here, you can specify text that will be tracked amongst non-playback defined expressions (it also works for Smart Shapes and measure-attached text). For instance, for a Penderecki effect, you might define a new expression “Behind the bridge” that will trigger channel #45, with keyswitch C1. Different wording may be separated with commas (e.g. “behind the bridge, penderecki”). Note that a custom expression effect will override any predefined Human Playback expression. For instance, you may change the way a “pizz" marking behaves. Use these options to customize Human Playback’s interpretation of dynamic markings such as hairpins and dynamic expressions. Type: Automatic • Key Velocity Only • Continuous Controller Only. 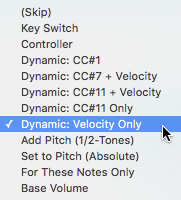 Click this pop-up menu and choose Key Velocity Only to apply crescendo/diminuendo effects as key velocityStrictly speaking, key velocity refers to the pressure or force with which a piano-style key is depressed. A key velocity value can be used in MIDI to denote the attack tone or the volume of a MIDI event (although MIDI CC 7, Volume, is more common for the latter). In Finale, key velocity is generally interpreted as volume, with one notable exception being several of the Garritan Instruments for Finale. data (generally used for non-sustaining instruments). Choose Continuous Controller Only to apply crescendo/diminuendo effects as Volume continuous data (generally used for sustaining instruments). Choose Automatic to instruct Human Playback to decide which type of data to apply for crescendo and diminuendos. Note that key velocity is always used for piano staves regardless of this setting. Curve: Automatic • Cubic • Quadratic • Linear. Click this pop-up menu and choose one of the options to define how Human Playback interprets crescendos and diminuendos. Choose Automatic to instruct Human Playback to decide which type of crescendo/diminuendo effect to apply. Hairpin Pair Emphasis. Move this slider to the right to increase the dynamic (espressivo) effect of hairpins in the score. Move this slider left to decrease the dynamic effect of hairpins in the score. Auto Expression Emphasis. Move this slider to the right to increase the dynamic (espressivo) effect of expressions in the score. Move this slider left to decrease the dynamic effect of expressions in the score. Automatic Diminuendo on Long Ending Notes. By default, Human Playback’s interpretation of long notes at the end of a score includes a diminuendo effect. If you do not want Human Playback to perform this diminuendo in, for example, a jazz score, uncheck this box. Dynamic Approach for Sustaining Instruments: Automatic • Volume (CC#7) + Velocity • Modulation (CC#1) + Velocity for Attack • Expression (CC#11) + Velocity. For percussive instruments and plucked strings, Velocity is used for dynamics (as is the GM standard). For sustaining instruments, such as winds, brass and strings, the type of controller used depends on the sound library. For example, Human Playback takes advantage of the unique dynamic approach in GPO of using Continuous Data Controller #1. For sustaining GPO instruments, dynamics are controlled by Controller #1 entirely, allowing a crescendo from the finest up to a on the same sustained note, with, unlike GM Volume, highly realistic timbre and dynamic changes. In this context, Velocity is used for the initial attack only (average attack value is 80 - See Optimize Attacks below). Because dynamic expressions use Velocity, one might ask, how does Human Playback avoid interfering with the proper attack? Human Playback doesn't modify the expression's definition, but actually readjusts every note's velocity depending on the current dynamic, to match the Attack Base Value. At first stage, this is done uniformly, but some further adjustments are brought for accentuated or staccato notes. Accents (Velocity peak in articulation) are also adjusted by Human Playback because GM and GPO velocities are not equivalent. Sforzando-like accents are given both a velocity peak and a Controller #1-based peak. A receives a maximum velocity accent value of 127, and an a maximum of 115. Once Velocities have been optimized, Human Playback processes hairpins (or flat dynamics if any) using Controller #1 throughout sustaining instruments. The setting for this option can be overwritten with a Technique. Optimize Attacks for Garritan libraries • Base Velocity. When Controller #1 is used for dynamic changes, Velocity for attacks must be adjusted because its meaning differs from GM completely. This option is on by default, with a base value set to 80. Base Instrument Volume (for Balance). Move this slider to specify the volume you want Human Playback to use for notes without dynamic adjustments. You can use these settings to combine custom MIDI data, such as edits made with the MIDI tool, with Human Playback’s interpretation. Continuous Data • Velocity • Start/Stop Time • Tempo. Here, you can specify whether you want Human Playback to ignore, incorporate, or use MIDI data you have deliberately applied to the score with the MIDI tool or the Expression Tool. Click the pop-up menu next to a MIDI data type and choose HP (Ignore Data) to use Human Playback’s interpretation for that type of MIDI data. Choose HP (Incorporate Data) to instruct Human Playback to use existing MIDI data of that type in the interpretation (existing MIDI data of that type will influence Human Playback). Choose No HP Effect to instruct Human Playback to disregard that type of MIDI data while processing the score (that type of MIDI data will playback as if Human Playback was set to None). All four of these settings apply to any MIDI data added to the score. For example, the Continuous Data setting applies to all continuous data, whether defined with an expression, or the MIDI Tool. To apply MIDI data to your score manually, see MIDI tool and To define an expression for playback. Anticipate Continuous Data By ___ Milliseconds. Some sound devices, in particular software synths, have a long latency, resulting in a gap in volume, pitch bend and other continuous data. This option anticipates the data sent to Finale, taking even slight tempo changes exactly into account. Default is 15 ms (for SmartMusic SoftSynth, GPO, and hardware sound devices). Suggested value for QuickTime is 200. You can use these settings to control the playback style of glissandi and pitch bends. Glissando & Bend Type: Automatic • Pitch Bend • Chromatic • Diatonic. Click this pop-up menu and choose one of the options to define how Human Playback interprets glissandos and bends. Choose Automatic to instruct Human Playback to decide which type of glissando/bend effect to apply. Note that the Pitch Bend option does not apply to piano, harp, or other percussive/plucked instrument staff. Glissando & Bend Curve: Automatic • Cubic • Quadratic • Linear. From this pop-up menu, choose the desired playback effect for glissandos and bends. Choose Automatic to let Human Playback decide the method to used based on the context of the music. A pitch bend or glissando assigned to a Cubic curve sweeps dramatically towards the end of the note. A Quadratic curve also reserves the most dramatic pitch bend effect for the end of the note, but at a more measured rate. Cubic and Quadratic would represent a common performance of a trombone gliss (for example). A pitch bend or glissando assigned to Linear ascends or descends in pitch at the same rate throughout the effect. Linear would be more appropriate for a chromatic glissando performed by a piano or other chromatic (or diatonic) instrument. 1/2-Tone Pitch Bend Range: None … 24. Use this pop-up menu to select the number of semitones to apply to 1/2 tone pitch bends. Garritan Instruments for Finale Pitch Bend Range is 12 semi-tones. Garritan Instruments for Finale can take full advantage of Human Playback's bends and glissandi. For GPO version 1 and 2 users, pitch bend range is adjustable in Human Playback, but the effect is uncertain because instruments have different actual pitch bend ranges (for example, violin=1 whole tone, flute=1 half-tone). Default is 12. Delay When Possible. Check this box if you want the effect to be tempered by the context of the situation. For example, a crescendo shouldn't start right on the attack if a slow string patch is used, otherwise the patch never plays at full volume. Use these settings to customize the playback style of ornaments and tremolos. Trill & Ornament Minimum Speed: ___ Notes/Second • Tremolo Minimum Speed: __ Notes/Second. Enter a value in these text boxes to specify the minimum number of notes per second Human Playback should perform for trills and tremolos. The trill might speed up depending on the context. Humanize Rolls and Trills. With this option selected, special GPO controller effects are applied to tremolos and ornaments to give them a more human feel. Use Pitch Bend Variations for Jazz Shakes Instead of Played Notes. Check this box to use pitch bend MIDI data to execute the shake instead of MIDI pitches. 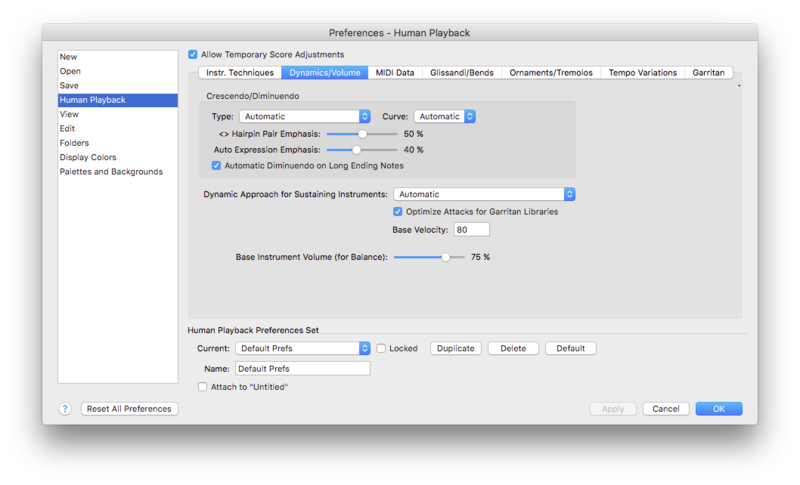 Use these settings to define how Human Playback interprets changes in tempo. Minimum Fermata Duration: ___ Seconds. Enter a value in this text box to specify the minimum number of seconds Human Playback should hold a fermata in addition to the note’s original duration. Ritardando Before Fermatas. Check this option to gradually reduce the tempo prior to fermatas (highly dependent on the context). Randomize Tempo Variations. Check this box to invoke random variations in tempo from performance to performance. 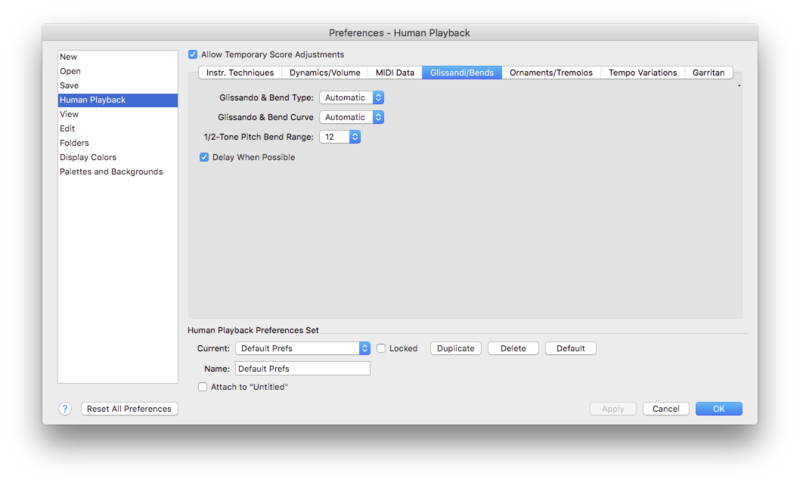 Use these settings to optimize Human Playback when using Garritan Personal Orchestra sounds. Noteman says: For the best experience in using Garritan Personal Orchestra with Finale, see Setting up Garritan sound libraries in Finale in our Knowledge Base. Enhanced Jazz Feel Using Automatic Tonguing. A common basic jazz articulation is for players to tongue offbeat eighth notes and slur onbeat eighth notes. It is also customary to play consecutive eighth notes more evenly than anticipations, which are usually delayed. Selecting this option causes Human Playback to automatically apply this tonguing pattern and swing feel. Note that Swing must be turned on in the Playback Controls for this feature to take effect. Apply Garritan Specific Effects to Kontakt2 Slots. Finale is not able to automatically detect which libraries have been loaded by Kontakt 2 (full version, not the Kontakt Player). When this box is checked, Finale assumes that all instruments loaded by Kontakt 2 are Garritan instruments. 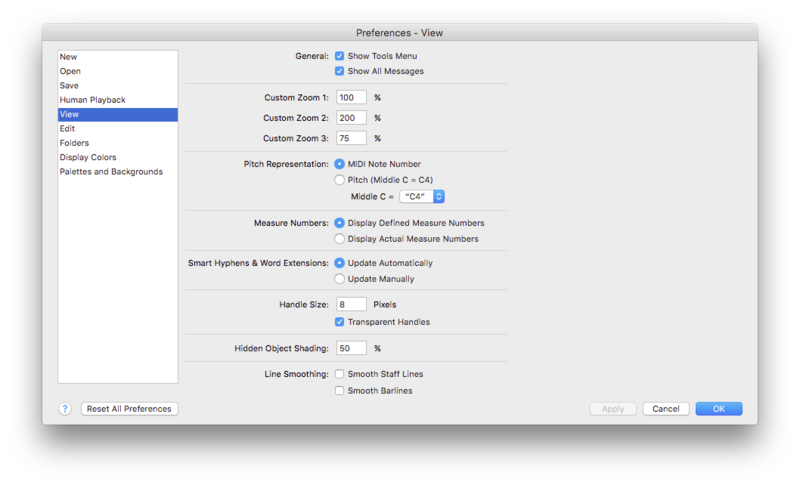 Choose Finale > Preferences and select View. Make settings regarding appearance of certain items program wide. Show Tools menu. Select this check box to display the Tools menu where you can select Tools from the menu instead of the Main Tool Palette. Show All Messages. Select this option to re-enable all messages that have a "Don’t Show This Again" check box. Custom Zoom 1 • Custom Zoom 2 • Custom Zoom 3. Enter custom zoom percentages as you wish them to appear in the Zoom submenu of the View menu. See View menu. Pitch Representation: MIDI Note Number • Pitch. Choose how you want Finale to represent MIDI notes throughout the application—by note number (middle C is always 60) or by pitch (C1, D1, E1, and so on). Click MIDI Note Number to display MIDI pitches by their MIDI note number. Click Pitch if you want Finale to spell out the pitch. Your choice is reflected in any dialog box that displays MIDI pitch, such as the MIDI Tool dialog box. You can choose to enter a MIDI pitch value in a dialog box as a pitch or as a MIDI note number. If the first character you type is a number, Finale assumes you’re entering a MIDI note number. Otherwise it’s assumed that you’ve entered a pitch, and Finale matches the pitch representation. The next time you enter the dialog box, the edit field displays the MIDI pitch value as a number or pitch, according to your Preferences selection. This setting is saved with program preferences. Pitch Representation: Middle C = C3 • C4 • C5. Use this drop-down list to choose whether you want Finale to spell middle C as C3, C4 or C5. MIDI manufacturers use various representations for middle C, so you can now change the display in Finale to match your MIDI gear. This setting is saved with program preferences. Measure Number: Display Defined Measure Numbers • Display Actual Measure Numbers. Select one of these options to control whether Finale displays the measure numbers that you defined in the Measure Number dialog box, or the actual measure numbers in the document. Finale counts actual measure numbers consecutively from 1, starting with the first measure in the document even if it is a pickup measure. This option is saved with your preferences. Depending on your selection, the "actual" or "defined" measure numbers are displayed in the Document Window’s Measure Control, the ScoreManager Start Measure column, and in edit boxes in any dialog boxes that display measure numbers (such as the Measure Attributes, Key and Time Signature, and Select Region dialog boxes). When "defined" measure numbers are displayed, and a measure number is defined in more than one measure number region (for example, in a document with several movements, each defined by a region), type the region number followed by a colon (:), then enter the measure number that you want to use. For example, if you have three measure number regions defined for a three-movement piece, with each region starting at measure 1, type 1:1 to jump to the start of the first movement (region 1), type 2:1 to jump to the start of the second movement (region 2), and type: 3:1 to jump to measure 1 of the third movement (defined by region 3). To specify Finale’s actual measure numbers when "defined" measure numbers are displayed, type #, the number sign (SHIFT+3), followed by the "actual" measure number. When entering Finale’s "actual" measure numbers, remember that Finale always considers the first measure of the document to be measure number 1 even if it is a pickup measure. Smart Hyphens & Word Extensions: Update Automatically • Update Manually. Choose Update Automatically to recalculate hyphens and word extensions as you edit the score. Updates are based on settings in the Word Extensions dialog box. Choose Update Manually to recalculate when you choose Utilities > Update Smart Word Extensions and Hyphens. Handles: Handle Size • Transparent Handles. Resize the handles by entering the desired number of pixels for handles in this text box. Check Transparent Handles to use handles that allow you to see musical elements behind the handle as you edit. Transparent handles are especially useful when entering staccatos, accents, and other small markings that may be covered up by opaque handles. Hidden Object Shading. In this text box, enter the shade percent age for hidden expressions (100% = hidden completely, 0% = no shading). Smooth Staff Lines • Smooth Barlines. Finale’s display includes font smoothing technology which enhanced the on-screen display for most items. However, smoothing produces what many report to be an undesirable ‘fuzzy’ effect for staff lines and barlines. Therefore, smoothing for staff lines and barlines has been turned off by default. Use these check boxes to enable smoothing for staff lines and/or barlines. Choose Finale > Preferences and select Edit. Here, specify undo settings, settings for movable items and font annotation, much of which is controlled in the Edit menu. Measurement Units: EVPUs • Inches • Centimeters • Points • Picas • Spaces. In a number of Finale dialog boxes, you’re asked to specify a measurement: the margins of each page, for example, or the thickness of eighth-note beams. Using the submenu of the Measurement Units command, you can select the measurement unit you want Finale to understand—and display—in all of its dialog boxes. You’re already familiar with inches and centimeters. Points and picas are typographical measurements; there are 72 points per inch, and 12 points in a pica. EVPU stands for ENIGMA Virtual Page Unit, of which there are 288 per inch. Select spaces when you want Finale to display spaces as the measurement unit in all the dialog boxes. Although one space is defined as the distance between staff lines, in Finale one space is equal to 24 EVPUs (which is Finale’s default distance between staff lines). Note also that one half-space equals one step, which is one line or space in a staff. You can override your global choice on a case-by-case basis, however. Just include the units, or their abbreviation, when you type any measurement number into Finale. For example, suppose you’ve selected Inches as your global unit of measurement. When you’re telling Finale how thick you’d like your slurs to be, however, inches may be slightly unwieldy for such a fine adjustment. Therefore, you might type “2 pt.” Finale automatically converts what you’ve entered into inches. Chime When Edit is Complete. Deselect this check box to prevent Finale from notifying you after a long edit action is complete. Substitute Font for Missing Unicode Characters. Select this option to scan your computer's library of fonts for an appropriate character to display if the current character's font does not include the Unicode character. When this option is not selected, Finale only displays characters that exist within the selected font. Allow Undo. You can undo almost any Finale operation by choosing Edit > Undo. After extensive Utility menu operations, however, you may discover that it takes Finale a long time to "catch up with you" when you click a different tool. If so, you might want to deselect this check box before you perform an extensive editing procedure (such as copying or pasting a large section of music). Finale not only recovers from large operations faster, but does not require the disk space necessary to store the score’s pre-operation condition. WARNING! Deselecting this check box will throw away the undo list - do not pass go, do not collect $200. You CANNOT use this option to pick and choose which actions to record in the undo list. Allow Undo Past Save. Select this option to undo even past actions you have saved. If this option is not selected Finale throws away your undo transactions after every save. Maximum Undo Levels. Set the number of Undo levels to allow or how far "back" you will be able to undo your edits. Setting this option to 0 will allow an unlimited number of undo levels. Respect Instrument Ranges when Copying or Changing Instruments. This option is checked by default. Uncheck it to disregard instrument ranges when copying, always leaving the music in its original octave. With this option checked, Finale automatically respects instrument ranges when copying music, or changing instruments in the ScoreManager. For example, when copying/changing from a flute staff to a tuba staff, the note are transposed into the tuba's range. The instrument’s “Beginner” range is used to determine the best octave transposition. See Instrument Ranges. If more than one octave transposition has the fewest out-of-range notes, the smallest transposition is used. Be aware that when "Respect Instrument Ranges When Copying or Changing Instruments" is enabled, music copied to a staff of the same instrument (including the source staff) is also transposed into the most playable octave. Reflow Measures: Do Not Reflow. Selecting this option from the pop-up menu will update your layout without affecting the layout or the size of your existing measures. Reflow Measures: Only Within Systems. Selecting this option from the pop-up menu allows Finale to update the spacing of the measures only within systems. When selected, Finale respaces the measures without changing what systems the measures appear in. Reflow Measures: Across Systems (Maintain System Locks). Selecting this option from the pop-up menu allows Finale to reflow measures into different staff systems, based on the measure width. When this option is selected, Finale calculates how many measures will fit on each system, and moves measures to new staff systems as needed. Locked systems are created when you use the UP and DOWN ARROW to move measures with the Selection tool, or when you choose Utilities > Fit Measures or Lock Systems. When this option is selected, Finale maintains any system locks, but reflows any ungrouped measures into other staff systems as needed. Reflow Systems Across Pages. This option determines whether Finale reflows staff systems into different pages. When this option is selected, Finale calculates how many staff systems will fit on each page, and moves systems to new pages as needed. If you prefer to maintain the current layout of systems in pages, make sure that this option is not selected. Automatic Update Layout. This option has no effect in Scroll View. In Page View, this option determines whether Finale updates the layout each time it redraws the screen. Finale actually updates the layout for the current page and discards the layout for all subsequent pages, although it doesn’t take the time to update the layout until you display the subsequent pages. When Automatic Update Layout is not selected, Finale still, on occasion, updates the layout. For instance, if you adjust the position of a staff or add staves, Finale updates the layout. Checking this option also checks Automatic Update Layout under the Edit menu. Automatic Music Spacing. Select this option to have your music automatically spaced as you enter it—at the end of a Speedy Entry measure, at the end of a HyperScribe session, or after each note in Simple Entry. The music spacing applied is based on the currently loaded spacing width library. See Music Spacing. Automatic Instrument Family Group Brackets. Check this box to automatically group Instruments when adding or changing them with the ScoreManager. With this box unchecked, changes to the instrumentation made in the ScoreManager do not include accompanying updates to group brackets, and changes to group brackets need to be made manually. See Groups and Brackets. (Note that with this box checked, Finale does retain manual positioning adjustments to group brackets as it updates to accommodate instrumentation changes.) To apply Finale's automatic groups and brackets to your score at any time, choose Utilities > Check Notation > Reset All Groups and Brackets. Automatic Instrument Family Measure Numbers and Endings & Text Repeats. Check this option to show measure numbers and repeats (endings and text repeats) on the top staff of instrument families. For example, if your concert band score has four horn staves, with this box checked, Finale automatically includes measure numbers on the top French Horn staff, first measure of each system, throughout. If you reorder or delete one or more of your horn staves, Finale automatically sets the top horn staff to show measure numbers (by checking the "Measure Numbers" for that staff's Staff Attributes (see Staff Attributes dialog box)). With this box checked, Finale behaves the same way if the measure includes repeat endings or text repeats. If the top staff of an instrument family is hidden for some systems via Staff > Hide Empty Staves, Finale includes measure numbers/repeats for the new top staff in the family for those systems. If the top staff of an instrument family is force-hidden (Force Hide Staff), measure numbers/repeats will not be reassigned to the new top staff. Arrow Keys Nudge Items By. Enter a value to specify the number of pixels Finale should move a selected Special Tools element, such as a dot or an accidental, each time you press a nudge key. For even finer adjustments, you can choose a larger view percentage in the View menu. For example, to move an element such as a stem length by one space, set the nudge amount in the Movable Items dialog box to six pixels (six pixels are equivalent to one space, which is the distance between staff lines). When you press the nudge key, if the scale view is 100%, the element is adjusted by six pixels (or one space). At 200% scale view, Finale still moves the element by six pixels when you press the nudge key. However, at 200%, six pixels are equal to one half-space, giving you twice as much control over the placement of the element. Note: The nudge "amount" only applies when you’re working with certain tools. When you use the nudge keys at other times, Finale adjusts the element by one pixel each time you press the nudge key. Automatically Constrain Dragging (Press Shift to Temporarily Disable). Auto-constrain is off by default. When it’s not selected, elements can be moved in any direction in the score. To temporarily constrain dragging in the initial direction of your drag, press SHIFT. If you prefer that dragging is automatically constrained, select this option. Dragging will then be constrained in the initial direction of your drag. To temporarily allow dragging in any direction, press SHIFT. Think of SHIFT as "reversing" the setting of this check box. Constrained dragging is temporarily disabled while slurs are being edited. Use SHIFT to enable it while editing slurs. Anchor Indicator Lines When Dragging or Nudging Items (Press Option to Temporarily Disable). Check this box to restrain expression attachment point regardless how far the expression is moved from its origin. When this command is not checked, the attachment point of expressions is updated while dragged or nudged (and OPTION can be used to temporarily fix the attachment point while dragging). When Pasting Between a Percussion Staff and a Pitched Staff: Maintain Staff Positions • Maintain MIDI Pitches. Choose Retain Staff Position to keep the notes you are copying affixed to the same staff positions while re-assigning the MIDI note when you copy from a percussion to a normal staff or vise versa. Choose Retain MIDI Pitches to remove the staff positioning in favor of retaining the MIDI pitch information. The Percussion MIDI Map used for each staff is listed in the ScoreManager. The MIDI Pitch of percussion staves can be referenced in the Percussion MIDI Map Editor dialog box. Orange notes in a percussion staff indicate the note is not assigned to a particular Note Type in the Percussion Layout Designer dialog box. A "percussion staff" is any staff defined to use "Percussion" as the Notation Style in the ScoreManager. Font Annotation. Click this button to open the Font Annotation dialog box, where you can fine-tune the selection area for font characters. For more information on annotating fonts, see Font Annotation. 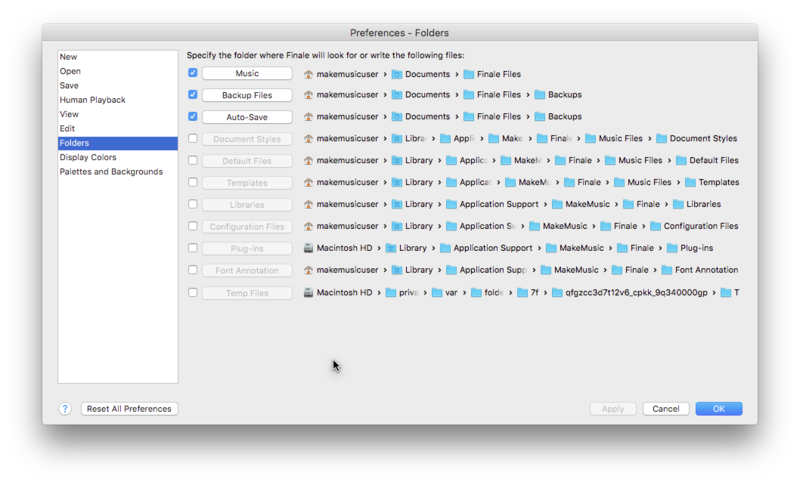 Choose Finale > Preferences and select Folders. In this category, you can specify different folders to store your files in. For default locations of Finale application components, see Finale Installation Details. Folders: Music • Backup Files • Auto-Save • Document Styles • Default Files • Templates • Libraries • Configuration Files • Plug-ins • Font Annotations • Temp Files. You can specify different folders to store your files in. When Finale saves or opens music or library files, it looks in the specified folders. Note that Finale uses the settings from the Maestro Font Default file, if the default file is stored in the music folder. If you do not enter alternate folders for the temp files, libraries and music files, Finale stores those files in the current folder. To select a new folder, type in the path and folder name, or use the Browse button for the folder you are changing. Choose Finale > Preferences and select Display Colors. Choose View > Select Display Colors. The Display Colors options allow you to assign colors to different layers as well as to different elements in your score such as articulations, Text Blocks and Smart Shapes. This is useful for differentiating between various objects in order to easily identify which tools created them, or to which layer they belong. 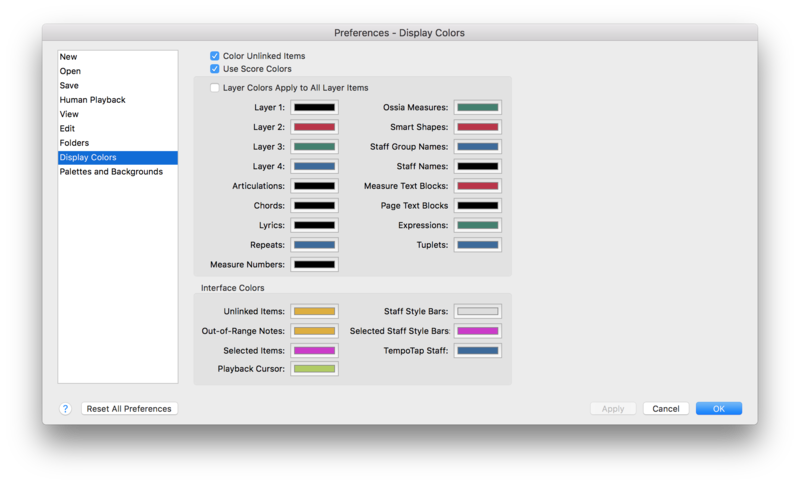 Display colors can be printed: select Print Display Colors in the Print dialog box. Color Unlinked Items. With this box checked, items that have been broken in a linked part change color (to orange). The item in the score also changes color indicating this item is broken in one or more parts. For example, if an expression is repositioned in a linked part, it will change color in the part indicating future score edits to the positioning will not apply to that item in the part (see Linked Parts). Use Score Colors. Select this check box if you want Finale to display musical items in color. If it is not selected, color is not used for musical items, but is still used for the interface elements. To print using the display colors, this check box must be selected. Layer Colors Apply to All Layer Items. Select this check box if you want Finale to set all items in layers 1–4 to the specified colors for each layer, including items such as expressions, chords and lyrics. Musical Elements: Layer 1 • Layer 2 • Layer 3 • Layer 4 • … • Tuplets. A number of items in your score can be assigned different colors. Click on any item button to choose a color for the item. The color specified for Layers are used for the Simple Entry Cursor and the notes entered. By default Layer 1 is black, Layer 2 is red, Layer 3 is green, and Layer 4 is blue. When printed, these layers are displayed in black. To print the displayed colors, select Display colors in the Print dialog box. The color specified for Staff Names will be used for all staff names in the score—both full and abbreviated names and the default, non-printing names. The color specified for Group Items will be used for all group names in the score—both full and abbreviated names and the default, non-printing names. It will also be used for the brackets and alternate barlines for the group of staves. Interface Colors: Unlinked Items • Out-of-Range Notes • … • TempoTap Staff. Some items in Finale appear only in the display to help you see how Finale is functioning behind the scenes. You can control the color of the interface items listed here. Click on any item button to choose a color for the item. Selected Notes refers to Control-clicking a note in Simple Entry. The Playback Cursor appears during Scrolling Playback. Staff Style Bars appear when Show Staff Styles is selected in the Staff menu. 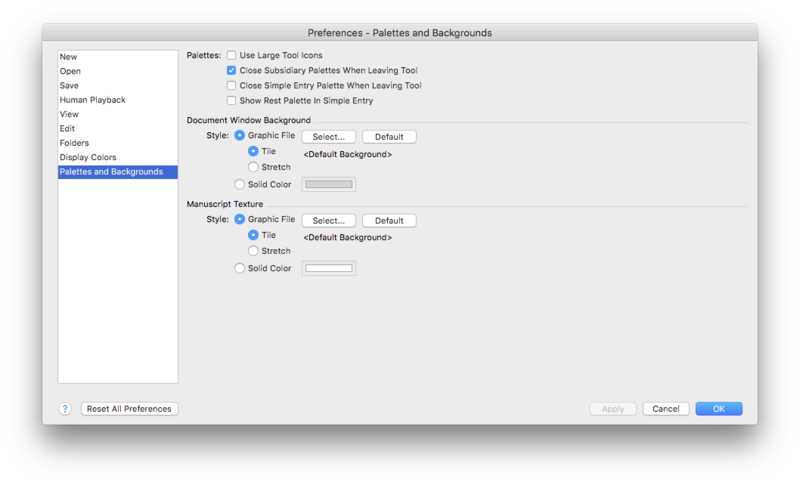 Choose Finale > Preferences and select Palettes and Backgrounds. This category allows you to customize the appearance of Finale’s palettes as well as customize the background color. Use Large Tool Icons. Select this option to display larger buttons on the various tool palettes for increased visibility. Close Subsidiary Palettes When Leaving Tool. If this item is selected, Finale closes the Smart Shape Palette and Special Tools Palette whenever you change to another tool. If you prefer to leave the palettes displayed, deselect this check box. Close Simple Entry Palette When Leaving Tool. When this item is selected, Finale closes the Simple Entry Palette whenever you change to another tool. Show Rest Palette for Simple Entry. Select this option to display the rest palette for Simple Entry. Document Window Background: Graphic File; Select • Default • Tile • Stretch • Solid Color. Click the Select button for Graphic File to choose one of Finale's backgrounds to place behind the score, or to choose your own background graphic. Choose Tile to tile the background graphic. Choose Stretch to automatically stretch the graphic to fit the background area. Click the Select button for Solid Color to choose a solid color for your background. Manuscript Texture: Graphic File; Select • Default • Tile • Stretch • Solid Color. Click the Select button for Graphic File to choose one of Finale’s manuscript backgrounds to place behind the music, or to choose your own manuscript graphic. Click Default to use Finale’s default manuscript background. Choose Tile to tile the manuscript graphic. Choose Stretch to automatically stretch the graphic to fit the page area. Click the Select button for Solid Color to choose a solid color for your background.